Mr. Lamp and Mrs. Bjork will be hosting an informational parent meeting on September 9, 2015 at 6:00 in room 115. This meeting will be for parents that have not signed up for the trip, but would still like additional information. Please contact Mr. Lamp to RSVP for the meeting. The PHS Visual Art department will be traveling to Italy in summer 2018 as approved by the Pewaukee School Board. This travel experience is open to students who have successfully completed Art History, AP Art History and/or AP Studio Art. The 10 day tour will feature stops in Venice, Ravenna, Florence, Assisi,Pompeii and Rome. We have held the meeting and distributed information for the trip. If you are interested and missed this information please see the details here. Mr. Lamp can also provide printed handouts with details. The deadline to pay the $300 deposit for the trip is due on Friday, June 5 to lock in the early registration savings. Late registration is allowed, but you may not receive the promotional price. We understand an international trip comes with a substantial monetary commitment for families and students. 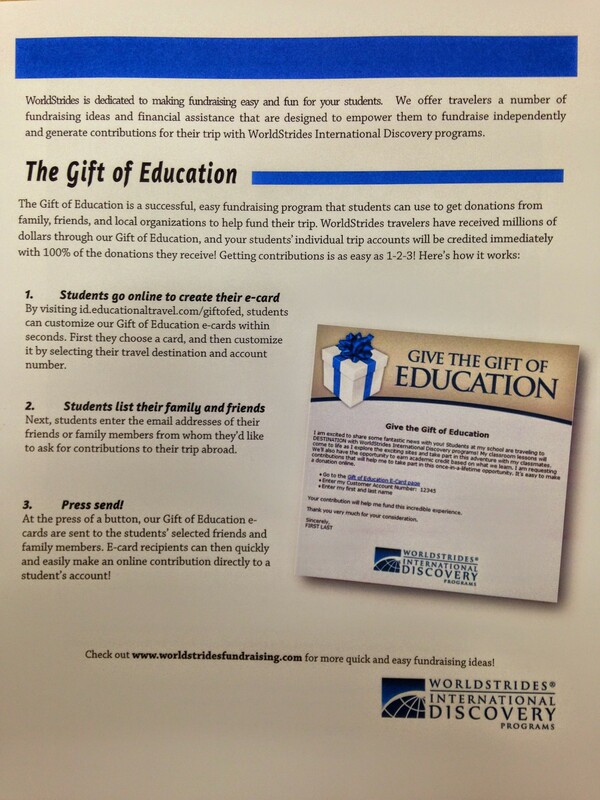 Below are some options that Worldstrides provides for student travel. In addition, the PHS Art Department will provide three fundraisers during the 2015-16 school year to help students and families with the cost of the trip. These fundraisers will not cover the entire cost of the trip. Students are encouraged to seek out other fundraising opportunities outside of school. We suggest establishing a GoFundMe account, asking local businesses for donations (possibly in exchange for a presentation upon returning), or seeking additional fundraising opportunities outside of school. We have selected Worldstrides International as our tour company for the 2016 Art Department trip to Italy. Below are links to information about Worldstrides and frequently asked questions about travel abroad programs. Parents are welcome to travel with the group at the same rate as students. However, the student price reflects triple or quadruple occupancy in hotels. Parents that wish to stay in a single room will need to add $910 to the cost of the trip, and parents that wish to stay with their child in a double room will need to add $350 to the cost of the trip. Parents will also need to have a background check on file with the Pewaukee School District. At this point we do not have any free chaperone trips for parents, and we do not anticipate any free chaperone opportunities in the future. Mr. Lamp and Mrs. Bjork will act as chaperones for this trip. During the 2017-18 school year we will have additional meetings for students attending the trip. These meetings will cover what to bring, what to expect while in Italy, how to prepare for the trip, and other frequently asked questions. We will inform parents and students when these meetings will occur, and students will be fully prepared to have a safe and successful experience.